DISCLAIMER: This post was developed in sponsored partnership with House Foods, however, as always, all opinions are genuine. 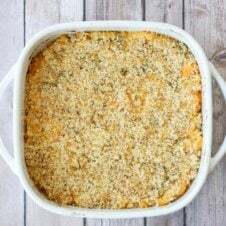 This recipe for Gluten Free Cheesy Pumpkin Pasta Casserole is perfect for a Low Carb Thanksgiving side dish! Recently I’ve had a craving for cheesy pasta, and had a friend over who was celiac. I needed to come up with a recipe using gluten free pasta and I thought it would be a good time to think of something holiday appropriate, as well. 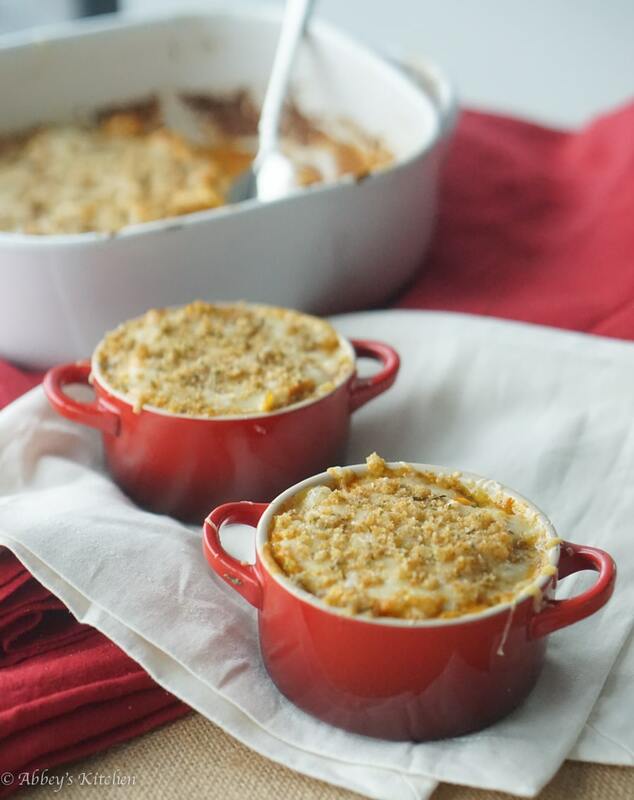 Introducing my Gluten Free Cheesy Pumpkin Pasta Casserole! Thanksgiving is around the corner, and while I surely have a lot to be thankful for this year (I’m engaged!! ), the festivities are not always wedding-dress-friendly. Between the lusciously fatty gravy, the sickly sweet pies, the stuff-me-so-full stuffing, and the buttery mash, it’s a wonder I feel like eating anything at all the next day. Ha, who am I kidding, I can always eat- especially when you tell me there’s going to be cheesy pumpkin pasta casserole on the table. While it’s really just a once (or twice, or thrice) a year indulgence that I fully support enjoying, sometimes you just want something a little lighter on the holiday spread. 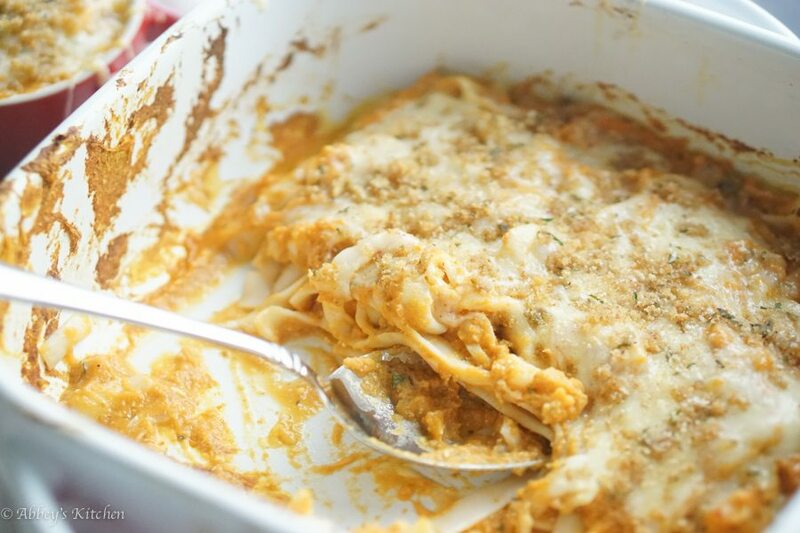 That’s why this is LOW CARB gluten free cheesy pumpkin pasta casserole. HELLO! This recipe using gluten free pasta offers your favourite holiday flavours and a layer of crowd-pleasing cheese, but with the low cal, low carb goodness of House Foods Tofu Shirataki noodles. Seriously, these shirataki noodles have become my secret weapon in the kitchen. It satisfies vegetarians, gluten free folk, and weight watchers alike, but no one will ever comment on it tasting like a “low cal” food. Sneaky, sneaky- because it is! 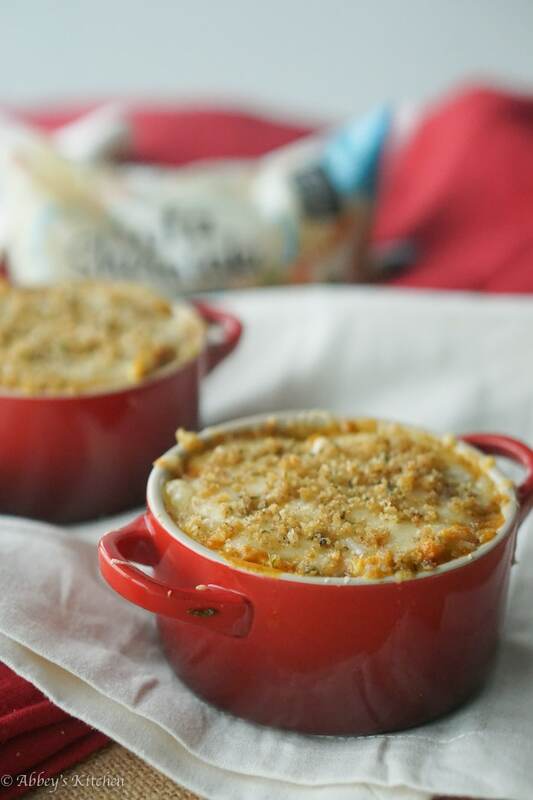 With half a bag of this gluten free pasta (about 1/2 cup) clocking in at 10-15 calories, 0.5 grams of fat, 3 grams of carbs and 2 grams of fibre, there is more than enough wiggle room for cheese in this baked “pasta” casserole. I also love that the canned pumpkin (which is brimming with vitamin A and fibre) is another great low-cal ingredient to balance out a holiday feast. 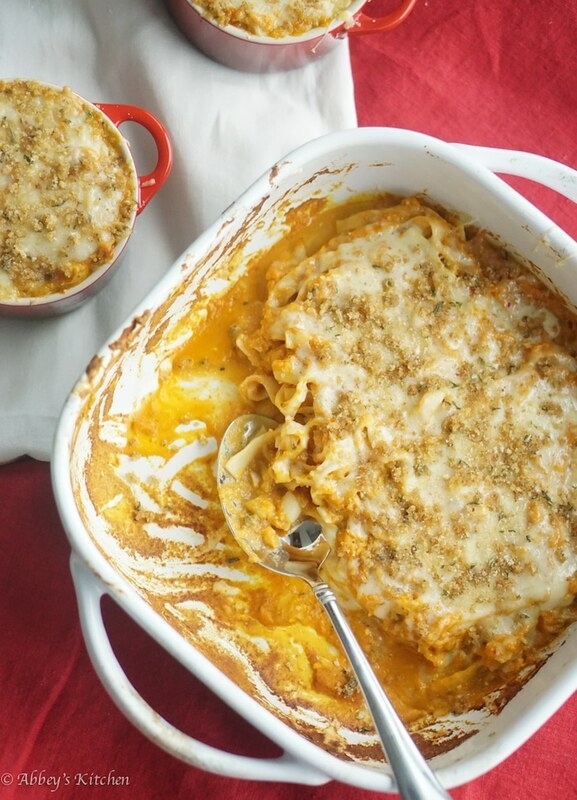 Give me ALL the gluten free cheesy pumpkin pasta casserole! I went into detail on how to prepare shirataki noodles in my recipe for Asian Cold Noodle Salad here, but to just drill home the most important point, you want to be sure to rinse, cut and dry. No need to worry about cooking this gluten free pasta before hand. They’re delicious as is- warmed through, served hot, or kept cold. Do you have any gluten free pasta recipes for the holidays? What’s your favourite healthy holiday dish? 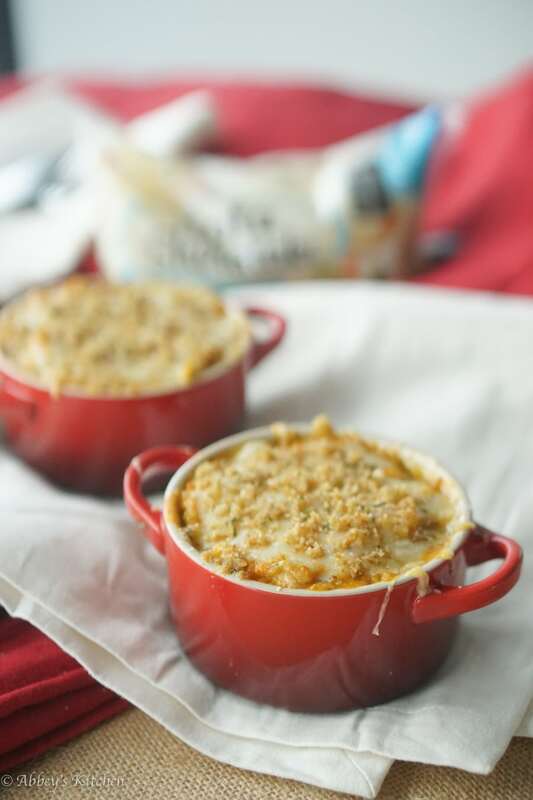 Have you tried this gluten free cheesy pumpkin noodle casserole? 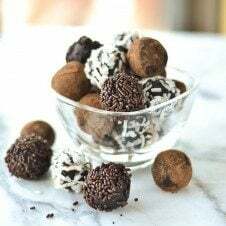 Leave me a comment below so we can learn from each other’s yummy traditions! Heat the oil in a large nonstick skillet over medium heat. Add in the onion and garlic clove and sauté until softened and fragrant. Stir in the broth, pumpkin, ricotta, parmigiano, sage, cinnamon and a pinch each of salt and pepper, to taste. Reduce the heat to low and simmer until thick and aromatic, about 5 minutes. Meanwhile, thoroughly rinse the noodles, cut them into manageable pieces and pat them dry with paper towels. Add them to the pan and stir to coat. 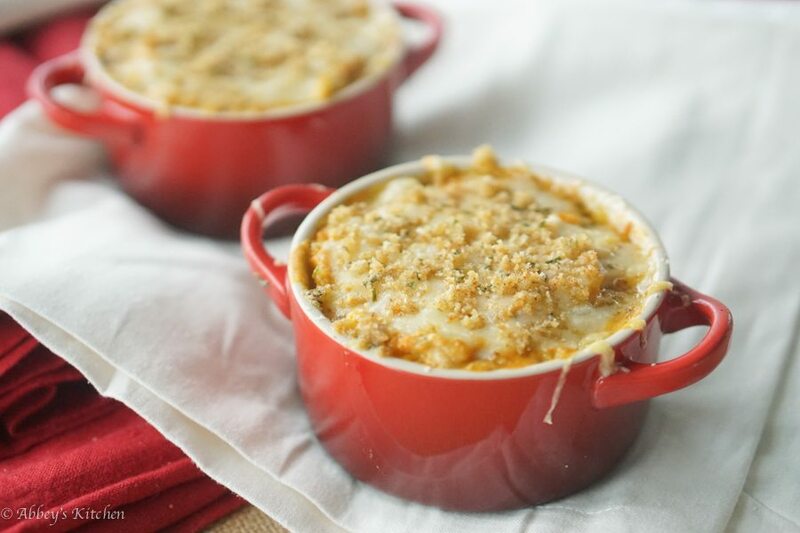 Transfer the pasta to four ramekins or a large 8” square baking dish. 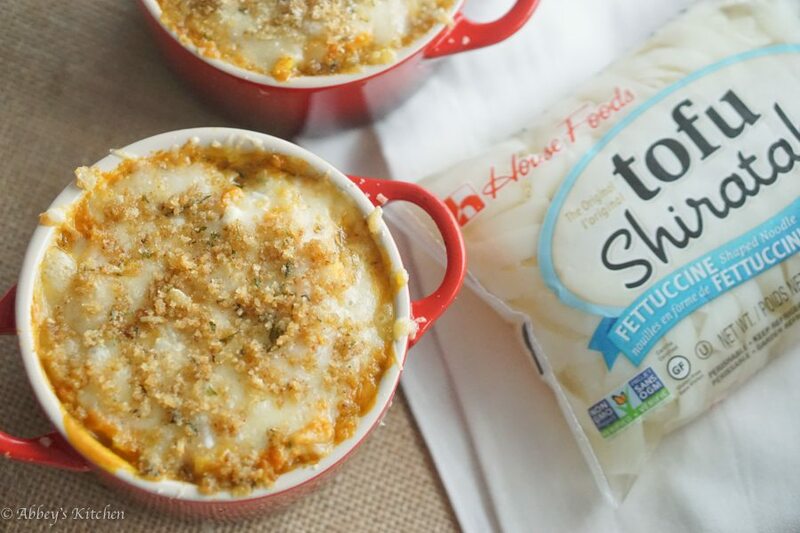 Top with the 2 tbsp of parmesan cheese and fontina cheese. Meanwhile, mix together the garlic, safe, breadcrumbs and olive oil. Sprinkle on top of the cheese. Transfer the dishes to the oven and bake until bubbly and golden brown, about 10-12 minutes. Enjoy! Disclaimer: The preceding recipe was developed in paid partnership with House Foods, however, as always, all opinions are genuine. 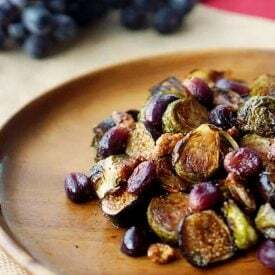 Next Post 10 Best Healthy Thanksgiving Recipes for Low Calorie Sides, Desserts and more! I love figs! Need to try this!